Home » Everyday » Coconut Oil Is Now Called a “Miracle” Dental Bacteria Killer! 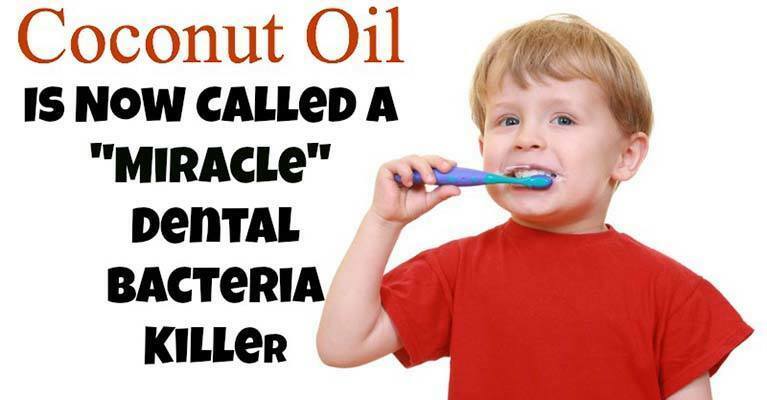 Coconut Oil Is Now Called a “Miracle” Dental Bacteria Killer! Dental cavities or tooth decay are terms used to describe the same condition – the damaging of the external surface of teeth caused by the activity of bacteria that dwell in plaque. On the other hand, plaque is described as a sticky matter that covers the teeth. The good news is that you can keep your teeth safe from dental cavities with the help of some efficient natural remedies. A scientific research conducted at the Athlone Institute of Technology in the Republic of Ireland has shown that coconut oil has the ability to eliminate bacteria that lead to tooth decay and at the same time it can boost dental health. It turns out that coconut oil destroys a specific kind of yeast called candida albicans which triggers dental diseases. Candida albicans occurs in people following a specific diet which is rich in sugar and processed foods. This infection can result in digestive problems too. The researchers were focused on determining the effects of coconut oil on regular bacteria strains inside the oral cavity like s. mutans, one of the usual suspects when it comes to tooth decay. The Irish researchers have reported that coconut oil modified by enzymes has the ability to replace chemical additives found in modern dental care products. According to Dr. Damien Brady, head of this research team, dental bacteria is a health issue that is often overlooked even though it affects between 70 and 90% of children and most of adults in developed countries. Using coconut oil as a dental healthcare product can be a great replacement for chemical additives and the best part is that the effects are visible even with small quantities of this product. With the help of coconut oil our body can absorb calcium well and help us get healthier teeth. In addition, coconut oil is excellent for the health of our gums and contributes to teeth whitening. The reason for this is simple – coconut oil has the ability to soak up heavy metals. How to Use Coconut Oil to Stay Safe from Cavities? According to many experts, you can just take one tablespoon of coconut oil and rinse the mouth with it for 15 minutes. After that, spit the content out and brush the teeth in a regular way. If you perform his procedure at least three times a week, you will get whiter teeth. In case you didn’t know, this procedure is called oil pulling. There is scientific evidence that oil pulling has the ability to lower the amount of hazardous Streptococcus mutans bacteria. According to the Global Healing Center, a study revealed in the African Journal of Microbiology Research performed eight years ago has shown that oil pulling leads to significant reduction of the count of these bacteria in the oral cavity and provides good protection against dental cavities. In addition, the antibacterial effects provided by sesame essential oil were analyzed too and scientists have determined that this oil has impact on S. mutans too. As a matter of fact, these scientific studies confirmed that there is a reduction of bacteria in general from 10 to 35%. After practicing oil pulling for 40 days, people have experienced reduction of 20% in oral bacteria. So, multiple scientific studies have confirmed that this oil can aid your efforts to protect your mouth from oral cavities and that it can be a great natural alternative to pharmaceutical drugs.